After a quick two days in Singapore, it was time to make the long journey back to Dallas. 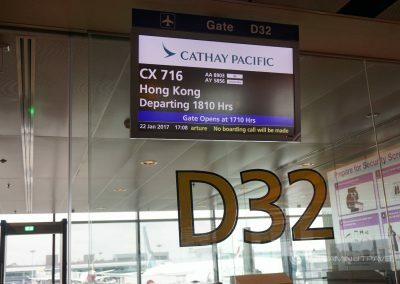 My itinerary was routed Singapore > Hong Kong > Los Angeles > Dallas with the fist two segments operated by Cathay Pacific. 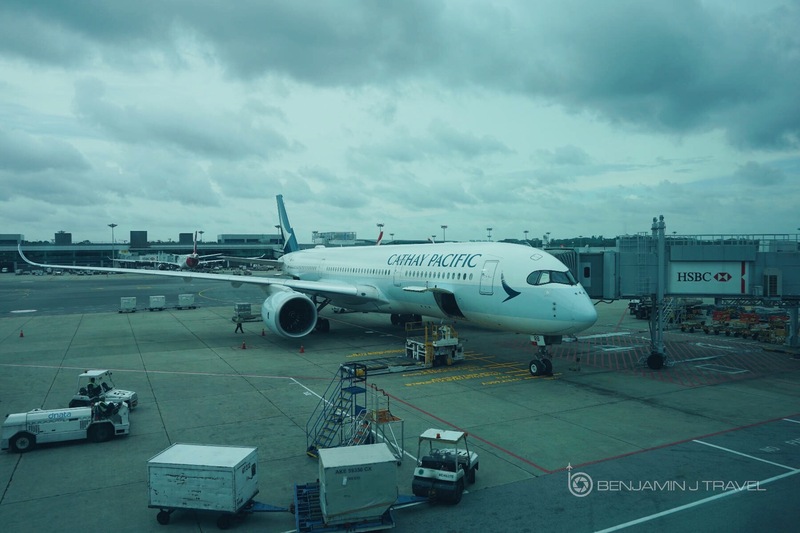 My segment from Singapore to Hong Kong would put me aboard one of Cathay Pacific’s brand new Airbus A350s. 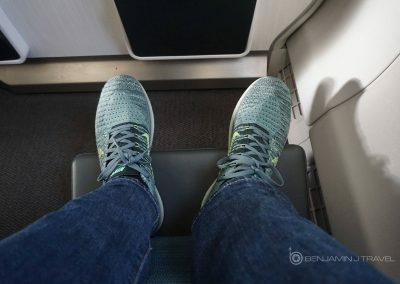 I’d flown all of my Cathay Pacific segments on this trip in Premium Economy but this would be my first time in Cathay Pacific A350 Premium Economy and my first Airbus A350 flight. Before departure, I had arrived at Singapore Changi Airport and spent about 90 minutes in the dnata Lounge in Terminal 1. This is the lounge that Cathay Pacific contracts for it’s eligible passengers to utilize in Singapore. Lounges in Terminal 1 are post-immigration but pre-security as each boarding gate has it’s own security screening. 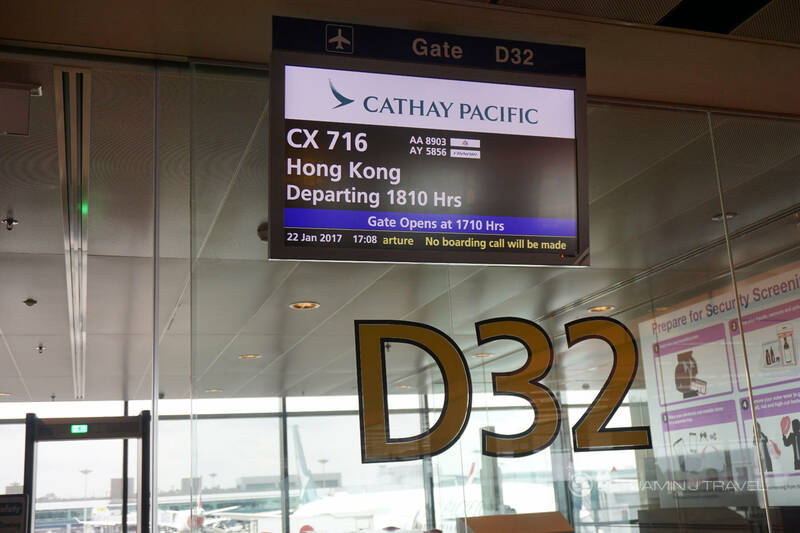 We were departing from gate D32 which is a short walk from the dnata Lounge. I arrived at the gate about 5 minutes before boarding time and there were two lines for security screening: one for elite and premium passengers and one for the main cabin. The security queue for our gate opened right at the scheduled boarding time and security was very quick. After passing security, there is a check-in desk and my boarding pass was scanned. Passengers were then corralled into partitions of the boarding lounge by cabin or elite status. Boarding got a bit delayed and passengers were asked to begin boarding before being halted. About 15 minutes later, boarding restarted, beginning with Business Class and OneWorld Emerald passengers. 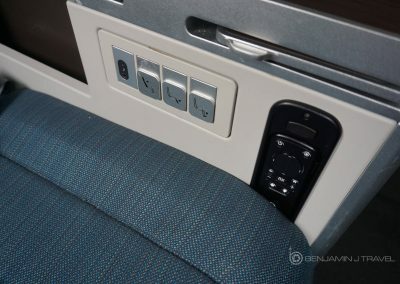 Once on board, I took a right through the rear Business Class cabin and to the Premium Economy cabin. 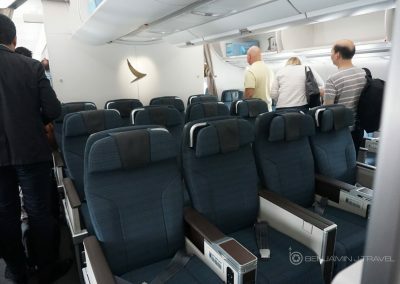 There are 40 seats in Premium Economy, laid out in a 2-4-2 configuration. 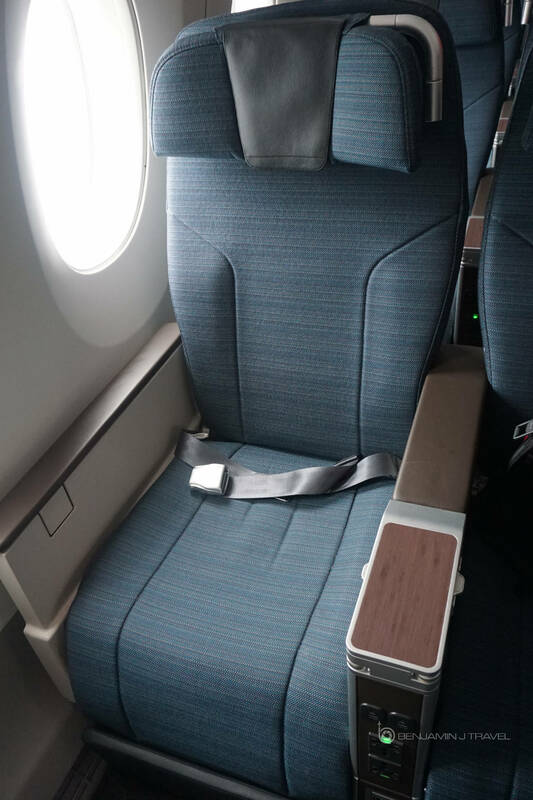 The last row of Premium Economy, row 33, only has two window pair seats. I was seated in seat 30K, the bulkhead window seat on the right side of the aircraft. The Premium Economy seat on Cathay Pacific’s A350 is an upgrade to the existing Premium Economy seat on the A330 and 777-300ER. 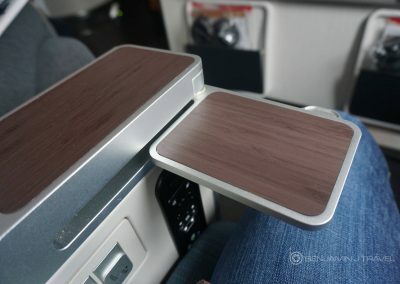 It’s quite similar to American Airlines’ Premium Economy seat on their brand new 787-9s. 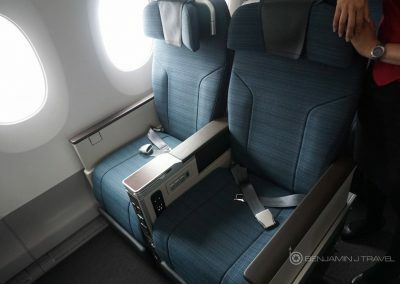 The A350 Premium Economy Seat is an updated version of the Cathay Pacific palette with forest green fabrics and dark faux wood finishes. 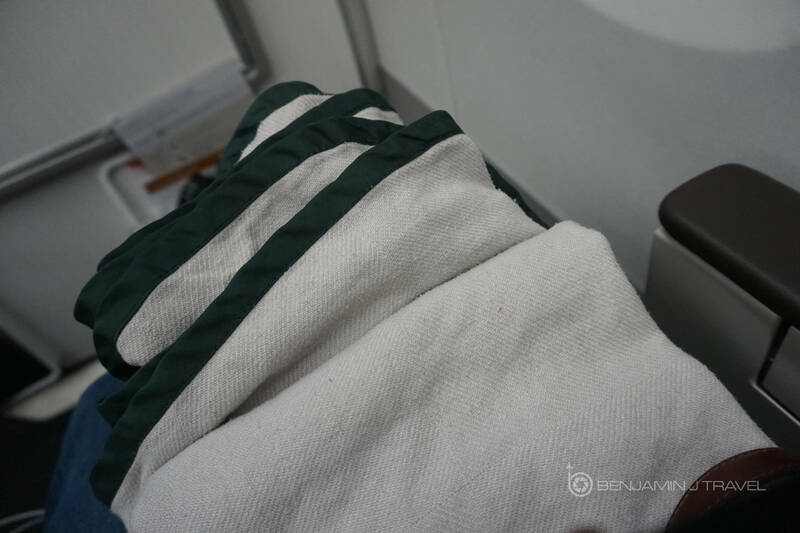 The fabric on the Premium Economy seats have a high-quality appearance. 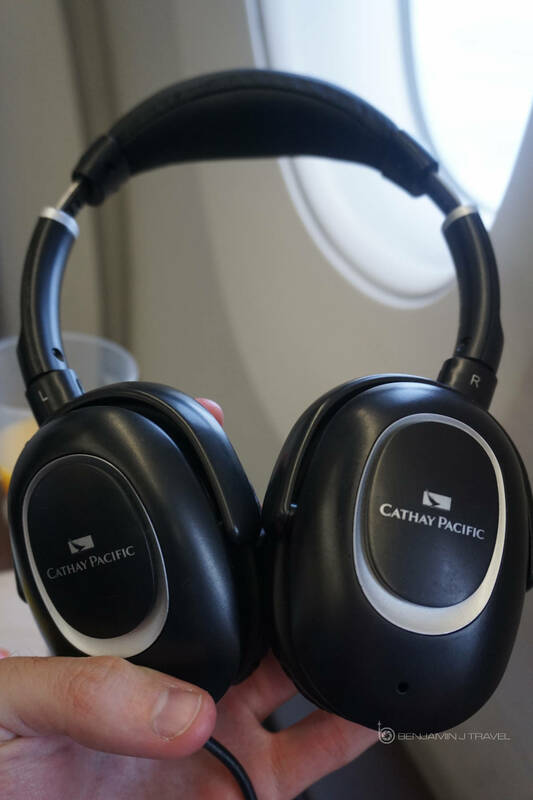 A blanket and noise-cancelling headphones are provided at each seat in Premium Economy. 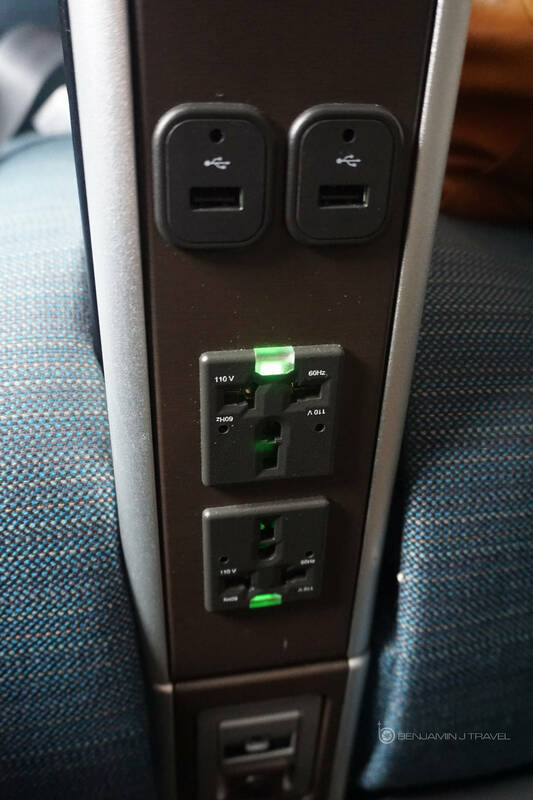 There are power outlets between each pair of seats and there are seat and IFE controls on the left armrest. 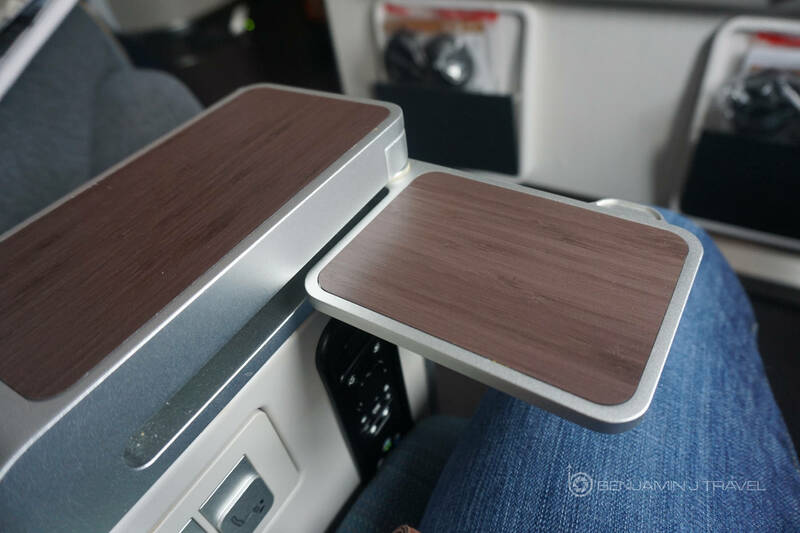 The tray table is tucked into the right armrest and folds away neatly. 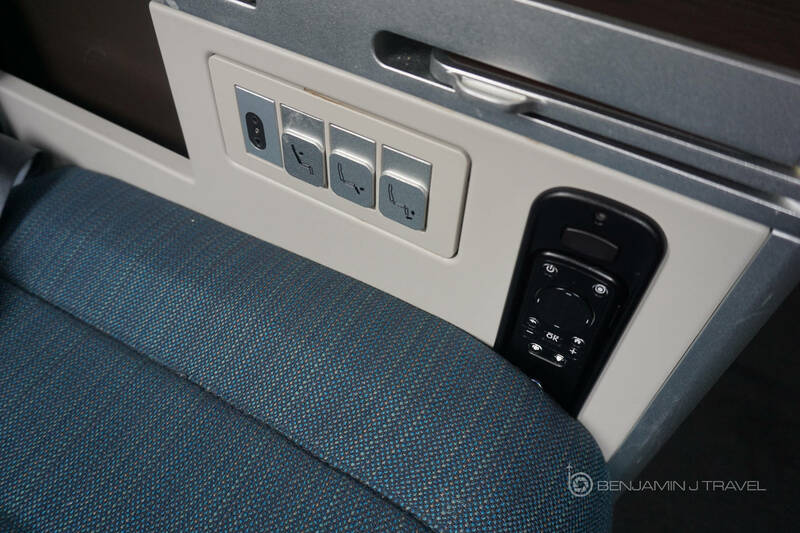 There’s also a small beverage tray on the left armrest. In Row 30, there is ample leg room thanks to the extra space between the bulkhead. Even with the leg rest extended, there’s lots of stretch room. 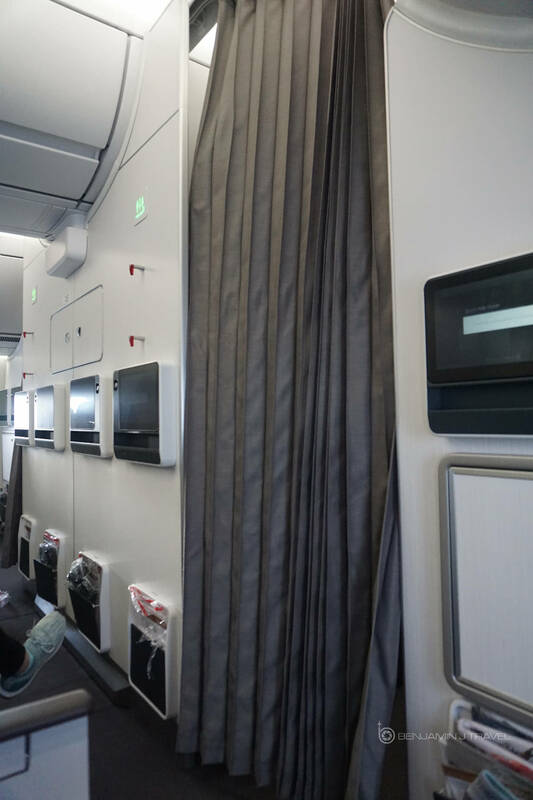 The cabin feels open and bright and the overhead bins are spacious.The seat is overall comfortable and the extra recline and legroom is greatly appreciated. 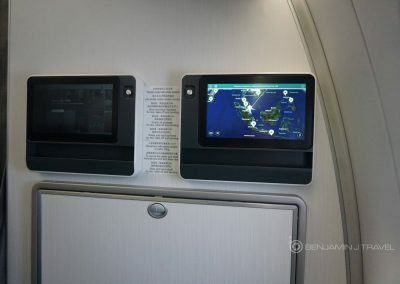 In the bulkhead row, the IFE screen is on the bulkhead wall rather than folding into the armrest. 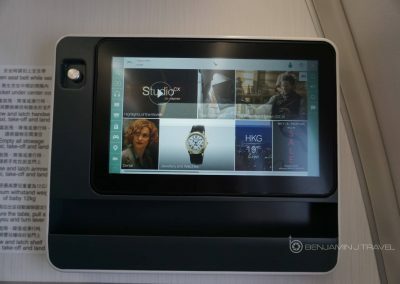 I prefer this as you can actually utilize your IFE screen during takeoff and landing rather than having to fold it away. 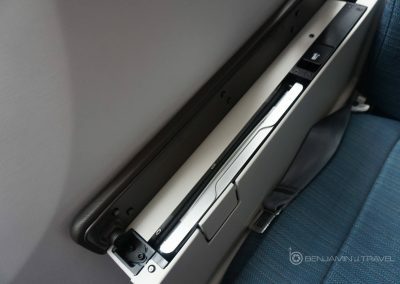 There are also individual air vents above each seat which I found to be a nice surprise. 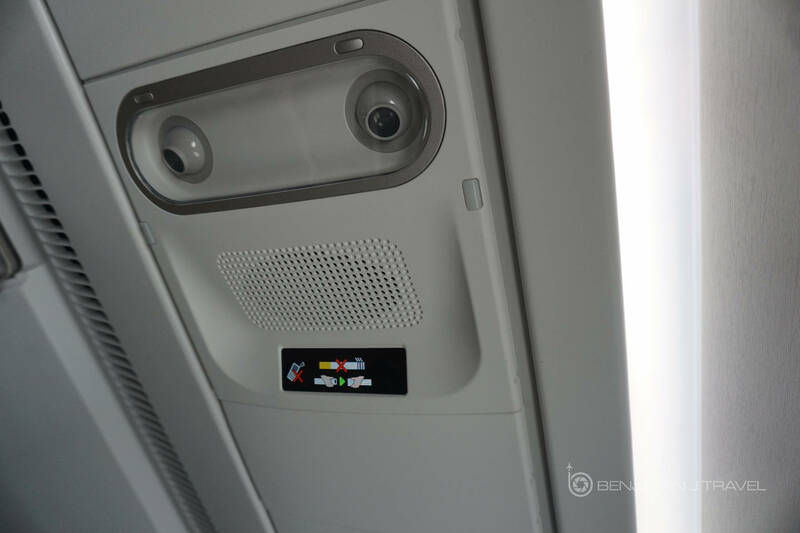 Widebody planes are always hit-or-miss when it comes to air vents. We pushed back from the gate just a couple of minutes behind schedule and were soon cleared for departure. 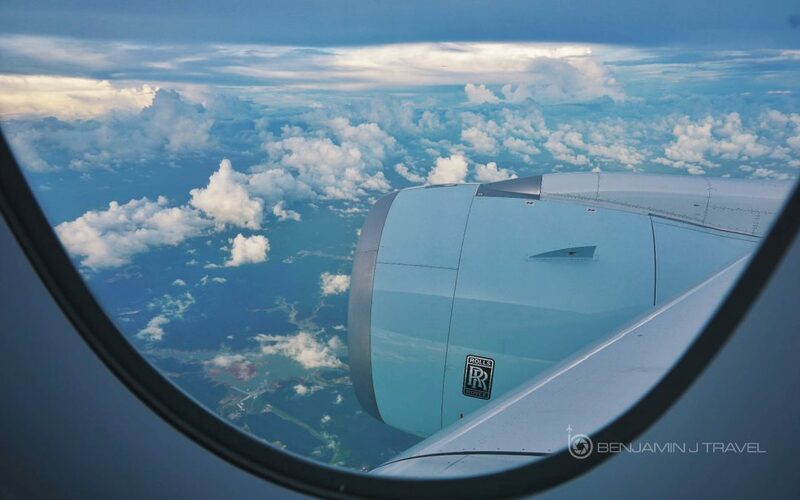 The climb out of Singapore was smooth and the pre-sunset skies offered a stunning view of the greenery Singapore and Malaysia.Shortly after reaching our cruising altitude, a post-departure snack service began. We were offered a choice of beverages and peanuts. 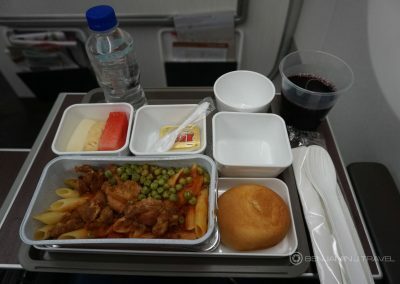 Dinner service was a bit slow to come out but about an hour after takeoff, dinner entrees were offered. Due to the short length of this flight, no paper menus were distributed, I opted for the chicken pasta which was rather bland. 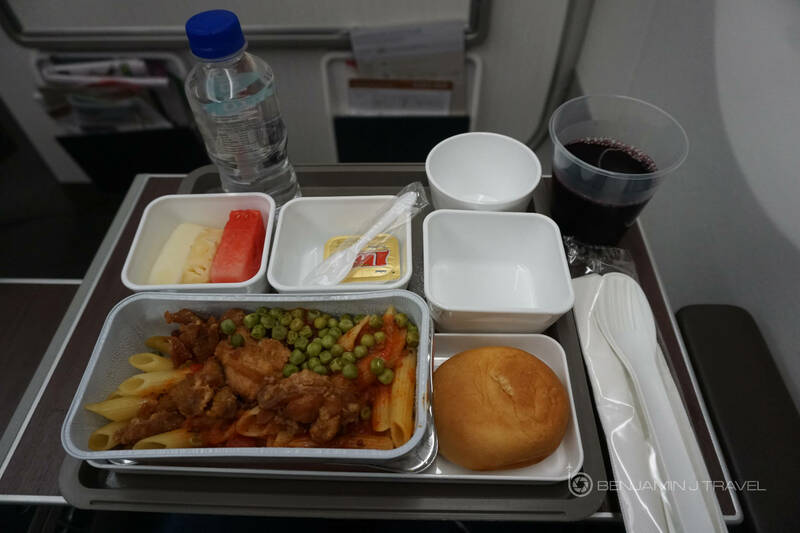 Cathay Pacific usually has good in-flight catering, even in Economy, so this meal was a bit of a let down. 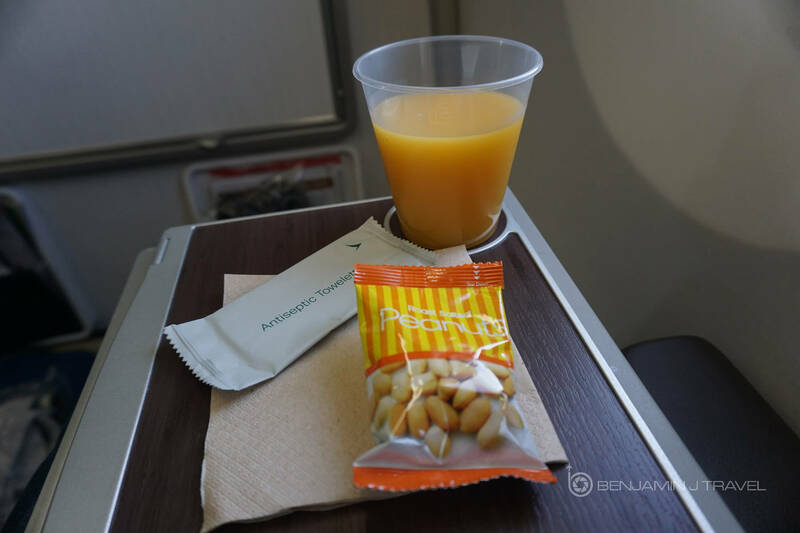 In contrast to other Premium Economy flights, glassware was not used but rather plastic cups. 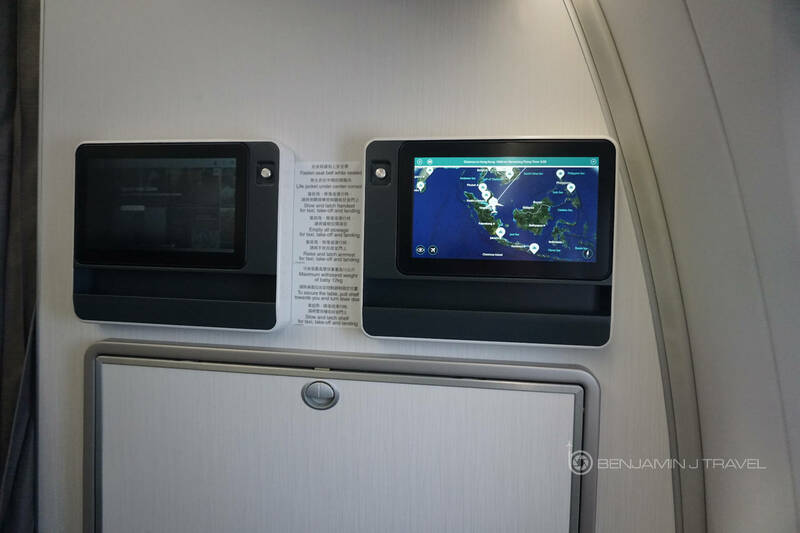 Out flight was smooth and mostly uneventful and I spent most of the flight watching a movie on the IFE. 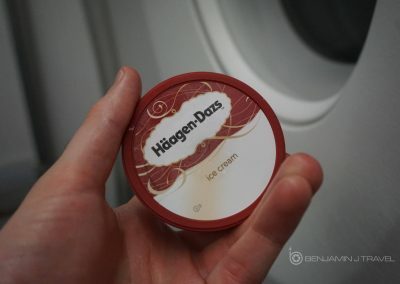 There was however, a man in the center section of Premium Economy causing a commotion on and off the whole flight. He was very demanding of the crew and making all types of odd demands. The crew seemed to try and cater to his needs as much as possible so perhaps he was an important passenger. He kept trying to change seats which I found quite annoying. 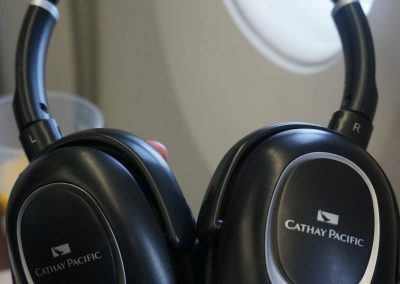 On all my other Cathay Pacific flights on this trip, I’d been greeted by the purser or one of the lead flight attendants and thanked for being a OneWorld Emerald customer. However, on this flight that did not happen. 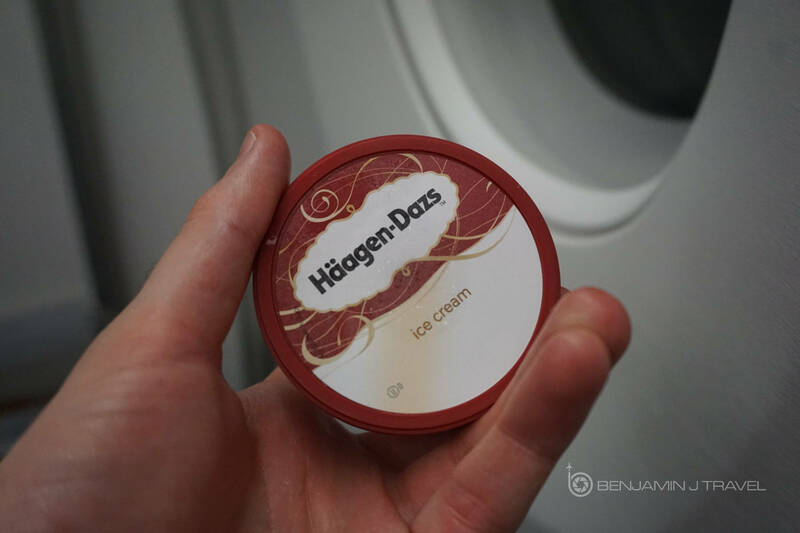 It was just a nice touch on the other flights and something you’d rarely receive on a domestic U.S. carrier. The service on this flight was fine but the crew was not very proactive. 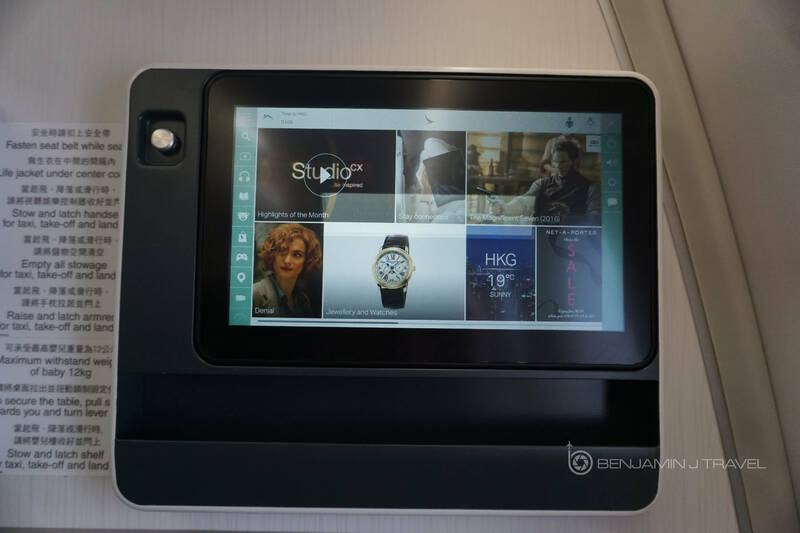 I have to admit I expected a bit better service from Cathay Pacific. 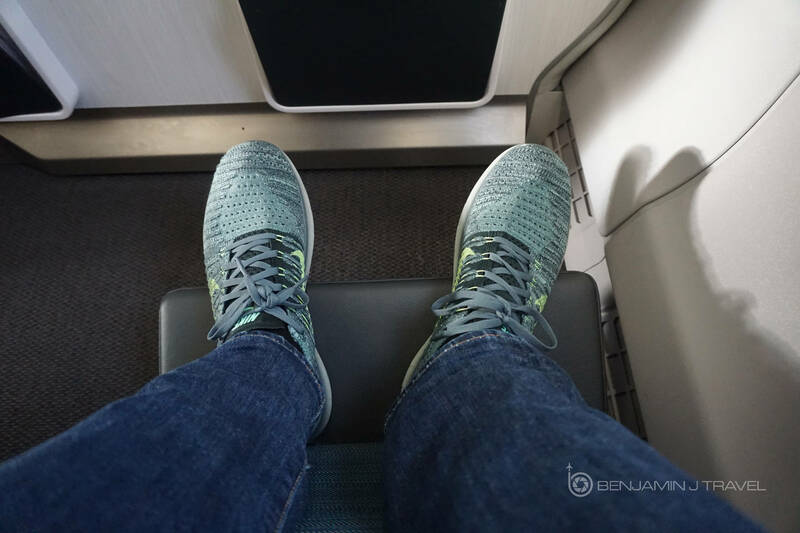 Overall, I enjoyed the hard product in Cathay Pacific A350 Premium Economy. 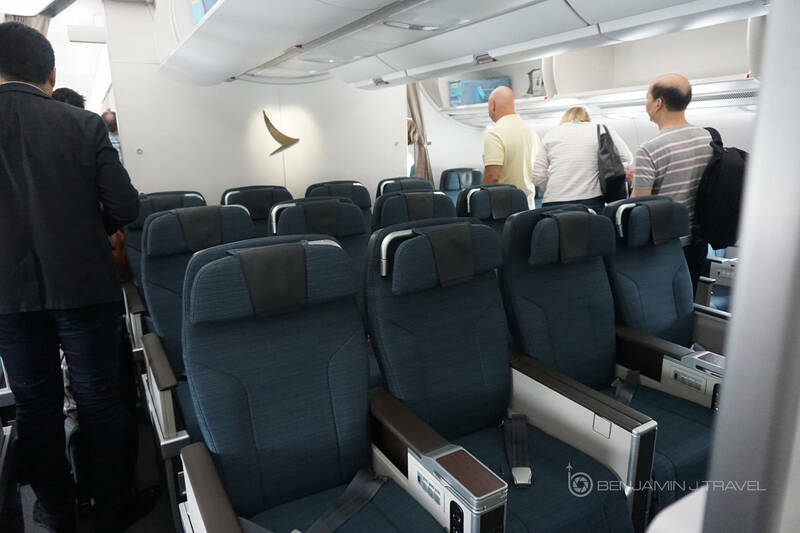 I found the seat very comfortable and the A350 offers a quiet, smooth ride. The meal service and service on this flight could have been a bit improved but by no means was it terrible. 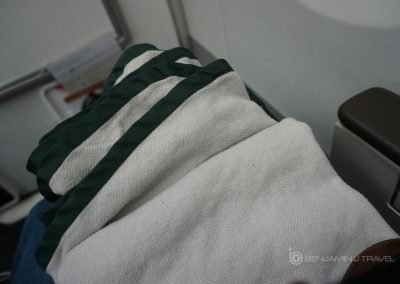 I’ve just come to expect a high standard of service from Cathay Pacific. 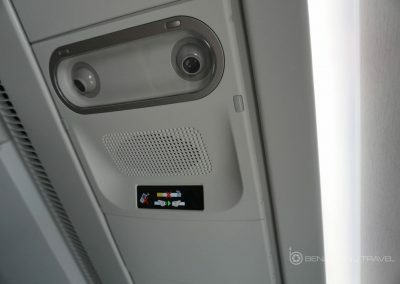 But I was focused primarily on the experience of flying the A350 for the first time rather than some of the details of the soft product. Excitement may have taken over! 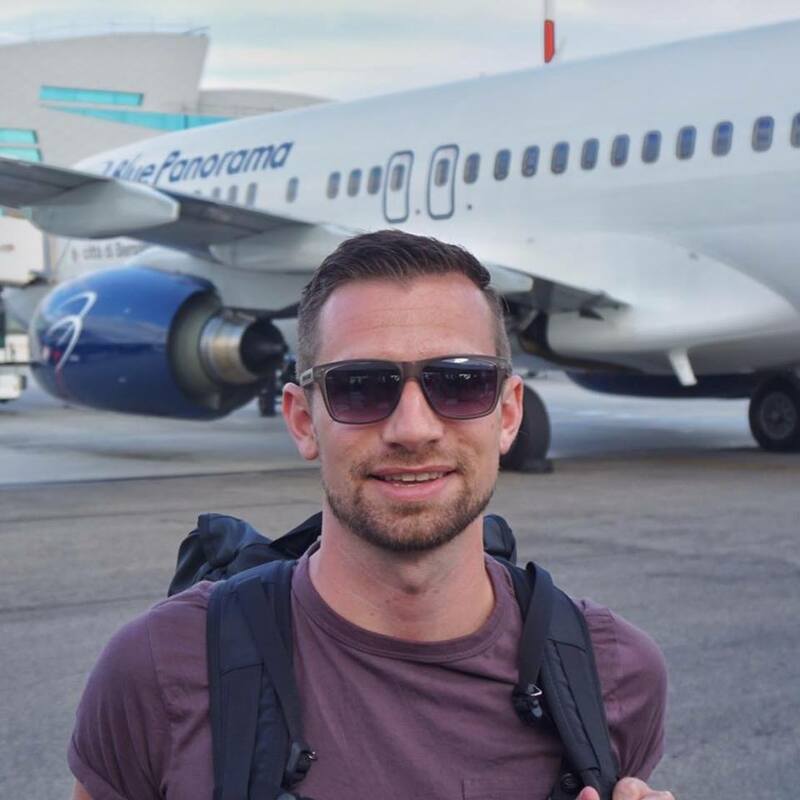 Have you flown the Airbus A350 yet? Let me know about your experience in the comments below. thks 4 the review, do u have to walk back to economy for the toilets? 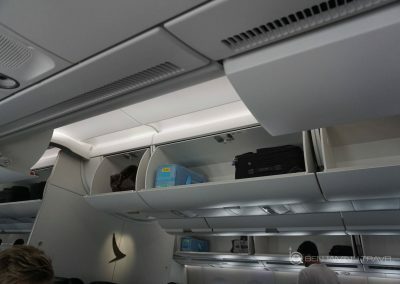 Yes, due to the layout of the A350, the toilets are to the rear of the Premium Economy cabin. 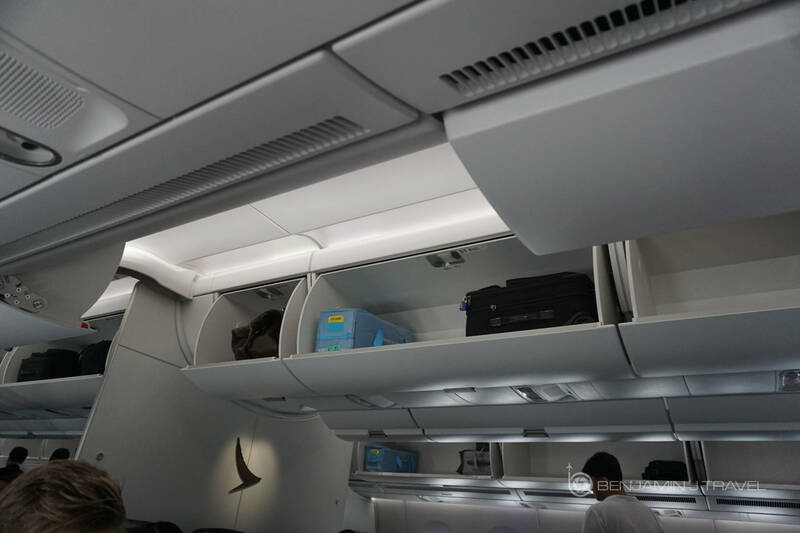 You mean the rear of the Economy cabin? It does not look like there are any toilets in PE. 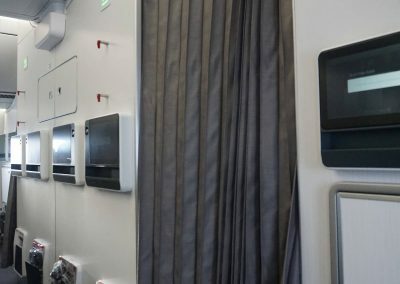 If you want to be specific, the nearest restrooms for Premium Economy passengers is to the rear, about halfway down the Economy cabin. 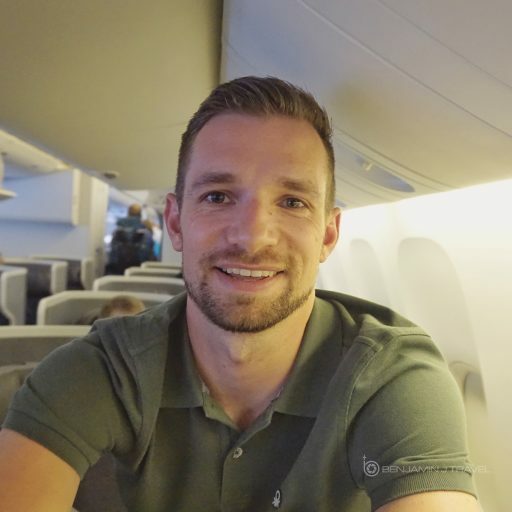 I’m looking forward to trying the A350 Premium Economy. 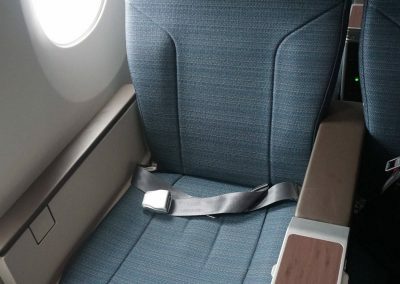 I’m flying its business class in December, but curious how comfortable PE is for Cathay’s long flights. Thanks for the pictures and the review! I think it’s overall a solid PE cabin. Plus the Cathay hospitality is always welcome. Enjoy your trip! Thanks! I’ll be sure to schedule something out of Dusseldorf (the only location for which CX flies the A350). Hey! Thanks for the review! 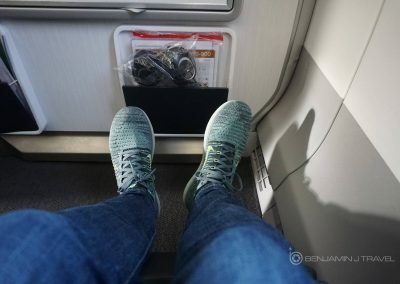 I’ve flown with other airlines in the same seat and have found stretching my legs to be a pain. I’m 6ft tall and wondered whether it would be the same on this plane? 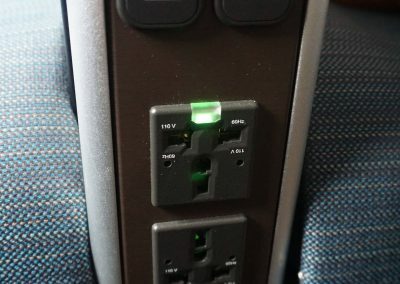 This can definitely be a problem with some bulked seats. 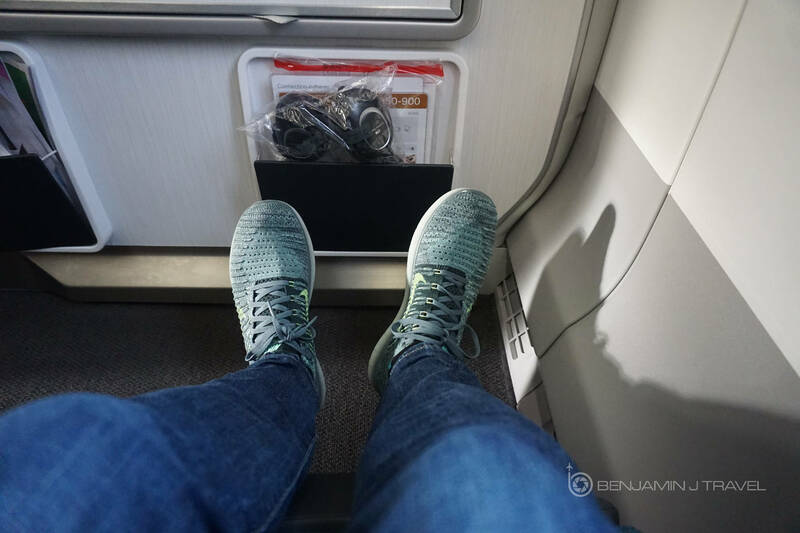 I’m 5’10” with long legs and I didn’t have an issue with the Cathay A350 bulkhead in PE. But it’s not an exit row so the legroom isn’t incredibly generous either.